L. Tweedyi is endemic to the Wenatchee Mountains of central Washington’s Chelan and Kittitas Counties. Also, it can be found in the Methow valley in B.C. Well drained mountain ecosystems with full sun. Wenatchee Mountains in Central Washington and the Methow Valley in B.C. L. Tweedyi grows primarily in dry rocky banks and talus slopes with full sun where ponderosa pine is found. A perennial evergreen plant which specializes in living on dry rocky areas so it encounters little competition. L. Tweedyi Is commonly found with ponderosa pine. 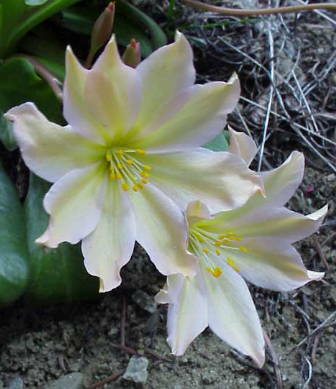 It is also related to a Lewisia found in more moist sandy soils near the Colombia. Seeds should be stratified for the winter, or sewn during fall in a place with cold winters as to break dormancy. It is best to use the seeds the season they are collected. However, if needed they should be cleaned of the sweet skin, which may contain a germination inhibitor, dried in a paper bag and stored in a cool place. In a paper bag in a cool place. Seeds should be planted in early spring after sufficient cold stratification. (Susansgardenpatch.com)Cuttings should also be planted at this time. “Well drained gritty soil in full sun” (Susansgardenpatch.com). After the plant has had sufficient time to establish it can be transplanted to the intended site. As L. Tweedyi is used to excessively well drained soils, watering should be done in small amounts. The pots can be kept on a layer of saturated sand so only the lower roots can access the water. Grows slowly and can life for many years, though not much is written about the lifespan. Populations spread very slowly as they rely on ants for seed distribution.